It’s officially summer! Yay! 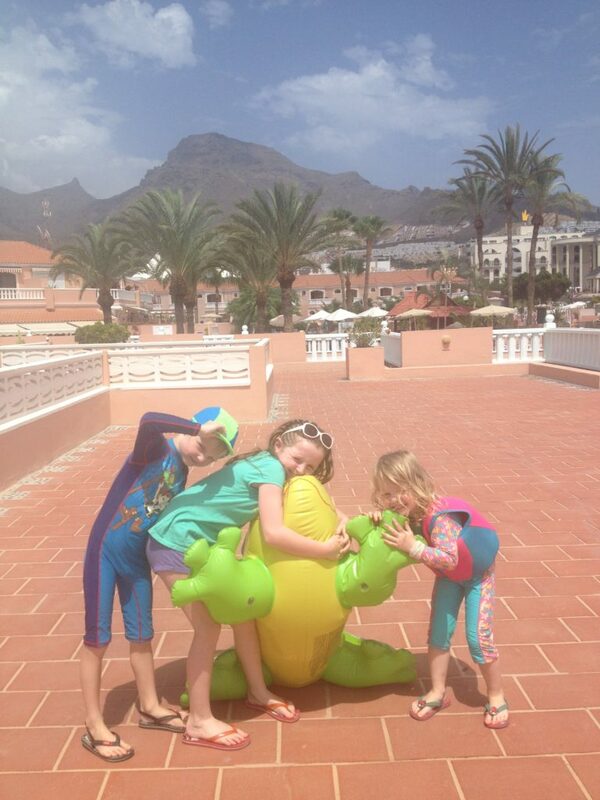 For a number of years we took an annual family holiday to Costa Adeje in Tenerife. With a few trips under my belt I thought it was about time I shared a few things my kids loved to do there which may be of use for anyone else lucky enough to be taking a trip there. Keep in mind that my crew were all under ten when we traveled so my suggestions are probably geared more towards the younger kids, although some are definitely suitable for older ones (and even Mum and Dad!). No brainer. My kids adore the pool and would happily spend every single day playing by it. What is important to remember is to make sure your accommodation has one. Of course practically every accommodation in Tenerife has some form of pool but best make sure to check before you book to avoid any disappointed kids! Tenerife is renowned for its black sandy beaches. Yes, you read that right, black sand. As a volcanic island the beaches are volcanic sand and as a result are dark grey / black. For some this may be very off-putting but I have to say it is great sand for making sand castles as it seems to be a bit stickier than the fine golden stuff. The beaches around Costa Adeje are fantastic. There are a few to choose from but we always headed to Playa Fanabe as it was right by our accommodation and we sat right in front of the lifeguard station which, with small kids, added a little bit of comfort should any issues arise. The water is really lovely but can get a little wild on windy days so care advised with young kids. A great day or even just a half day out. Just be prepared for mega wash down afterwards. You will be finding black sand in every crevice for days! Right in front of the beach at Playa Fanabe are four trampolines with harnesses attached. While my kids fondly refer to it as “the bouncies” or the “bungee jumps”, the correct name for it is Super Bounce and it is massively popular. Our first year only my oldest did them, my little man declined and my youngest was too small. You have to be 15kg and aged 3 or older and you are weighed before you get on. By year two the same situation prevailed however something clicked in my little man after seeing his sister doing them again and he asked to do them a couple of days into the holiday. Of course this led to much sadness from our than 2-years-and-10-month-year-old so we promised her we would let her queue and show her she was too small on the weighing scales. She hit 15kg on the dot and the man let her go on. Well that was it. I have lost track of how many times they have done them at this stage. Super Bounce opens in the morning (around 11am) and runs all day, right through to about 11pm. It is most popular just after dinner time (about 9pm) where you can expect queues so we often went pre-dinner when it was both brighter (better for photos or video) and quieter. Just be careful during the day as both the sand around them and the trampolines can get a bit hot on the feet. It is €5 for 5 minutes so not cheap which really added up when they wanted to do it all the time (we restricted them to every few days) but the kids adored it. Bouncing, doing flips and just generally having fun. Highly recommended from my kids. It was only on our third trip that we finally gave Crazy golf a try. The crazy gold is located right next to Super Bounce (above) on the strip at Playa Fanabe. It was great fun. We picked a slightly cloudy afternoon. I would imagine tackling it in the hot sun might not be as fun. It is open until 11pm and so an evening session might be a good time to try although a little busier. My two criticisms would be that first it was a little on the expensive side – about €25 for all of us – and second that we felt a little under pressure when people came up behind us and had to wait for all five of us to finish our hole. Of course we could just let them pass but it does take from the fun a little. 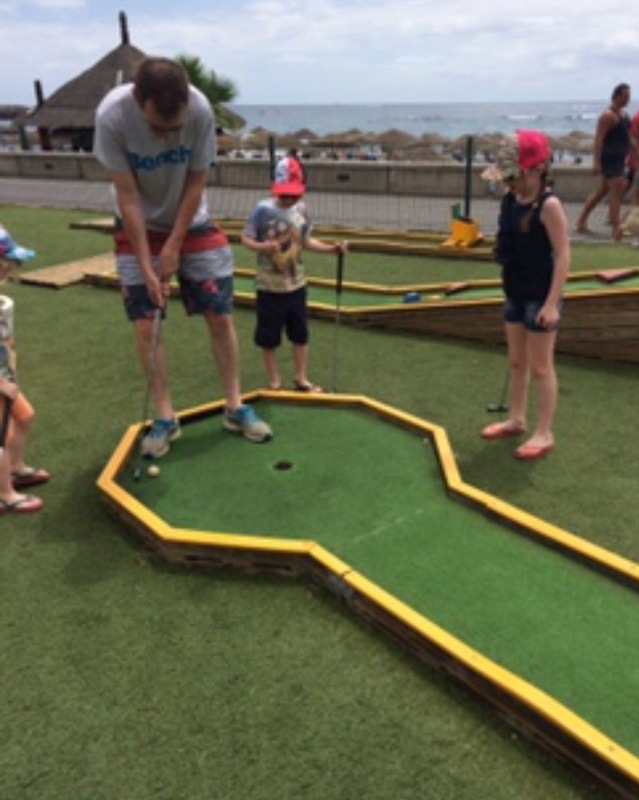 Nonetheless it was massively popular with the kids, particularly my little man who took great pride in the fact that he got the ball straight through a cannon on one of the holes, a feat Mammy and Daddy definitely didn’t manage. Sometimes it is nice to take a break from the sun and retreat indoors even briefly. 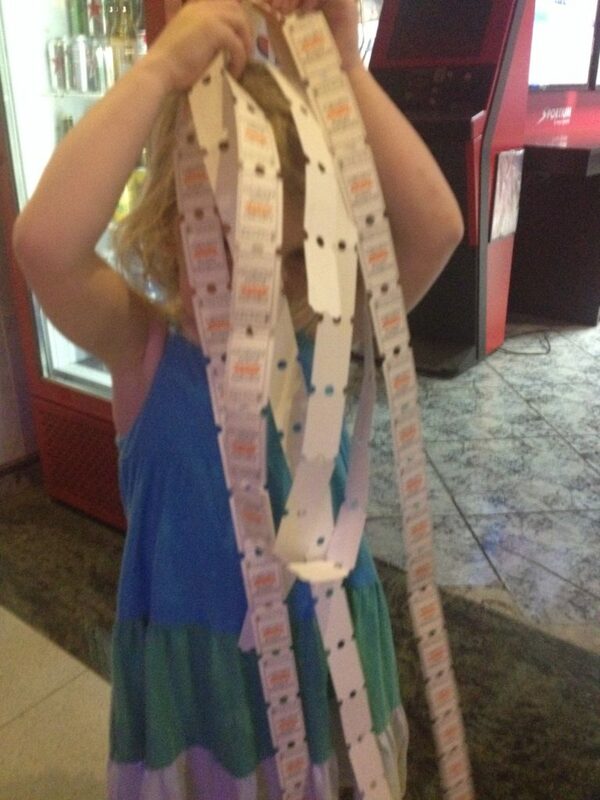 Given our kids ages at the time a stint in a soft play area was always going to be a winner. Within Costa Adeje there are two that we tried. The first is in Miki Park in the El Duque commercial centre. It is a reasonably sized play frame that we first tried on our second year in Tenerife. The kids loved it though they did get very hot and sweaty there. We ate lunch and drank a beer while they played within our sight. On our last visit they seem to have redeveloped and moved the playframe. It is much cooler but the food facilities were not yet re-developed (although we did get a beer). We had to go downstairs to grab lunch with the kids before returning upstairs for some more play. It was €5 per child for all day entrance which means you can come and go and paying that is better value than paying for an hour or two. The other soft play area is a playframe down on the beach front in Playa Torviscas, beside McDonalds. The first two years we were there it wasn’t open but third time lucky it had opened up. The kids were dying to try it out. Personally I found it a big disappointment. The play frame was limited and while there were some bouncy castles, one or two were in the sun and too hot to bounce on. At €4 per child for 30 minutes it was not as good value as Miki park. A huge part of our Tenerife trips was a pretty much daily trip to “Kasino” which is a games room. You know the type; various slot machines, air hockey and pool as well as a full bar and of course for adults a casino area with fruit machines and roulette. The kids loved playing the various machines while Mammy and Daddy sat down for an after dinner drink while keeping a watchful eye on proceedings. With my fluent Spanish-speaking husband we got to know the owners which resulted in many late night Spanish conversations, large shots every night and complementary leaving drinks. For our third trip a new machine of the TV game show Deal or No deal had been added to the Kasino. The kids adored it and depending on how well they did the machine would fire out tickets which could be exchanged for soft toys. Lets just say we traveled home with about 15 additional soft toys thanks to our regular visits to Kasino. The Kasino we visited was right next door to our hotel (hence our nightly visit for a night cap before we headed back to the apartment) but I believe there are others, as in it is a chain, around the area. That said the one we frequented seemed to be re-branding to a new name so not sure what is happening there….though it didn’t change the fun we had! Bowling is not something we do as a family very often except when we are away. Tenerife was no exception and there was a bowling alley, Mega bowl right next door to our accommodation on Calle Londres, in a lovely air-conditioned building so we gave it a go. A great evening activity and there are all sorts of deals to get drinks and/or food as well as the game of bowling. Costa Adeje is blessed with not one but two amazing water parks, including the worlds biggest, Siam Park. With our kids so young on our first year we were advised that the other park, Aqualand, would fit the bill. It did and when we returned to Tenerife the following year we went twice. First time using points earned from our hotels loyalty programme and second time on a discounted rate as when you leave from a visit they offer a return for only €8 per person (young kids free). We did the same on our most recent visit so it made it a very reasonable couple of excursions for us. It’s a lovely park. Plenty to do for young kids and every year we have been there have been changes; new slides and improvements. Mammy even tackled the Kamikaze! There I am having a moment of madness! There are so many different excursions to choose from I certainly can’t go through them all. It depends on your kids ages and what you are looking for. There are boat trips, half day trips, island tours; you name it. It was really only this year we ventured towards excursions outside of the water park. We took a boat trip which was lovely to go dolphin and whale watching. Only downside; a bit of sea sickness from our younger two which did put a bit of a dampener on the trip so choose any excursion wisely and make sure it is child friendly. Whatever you do, have fun! 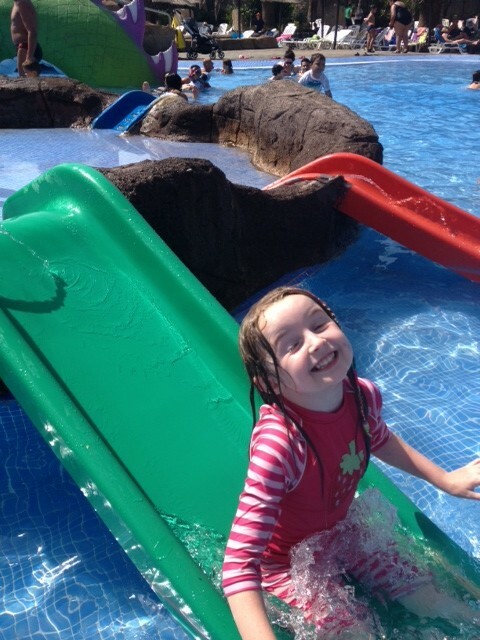 Costa Adeje is a really great family friendly spot for a super holiday. 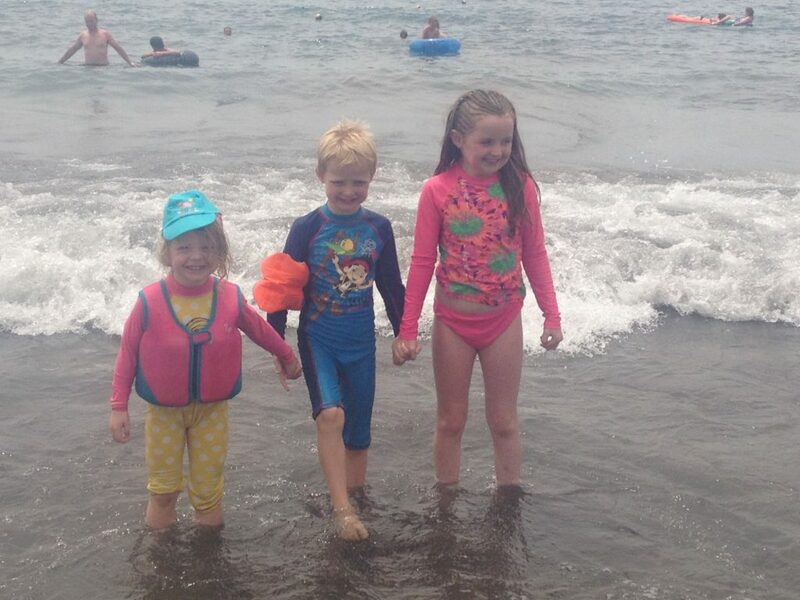 If you want to look at other family friendly summer holiday destinations check out some of my other favourites.